It’s the end of the week! I still have so much to share with you. Those ideas will just have to wait until next time. So many plans, so little time! I’ve had loads of fun with the Husqvarna Viking Brilliance 75Q. It’s truly a dream machine to work on with many great features that’ll make your sewing projects super easy and very professional looking. Today, I wanted to show you a couple of presser feet that make quick work of inserting a zipper and some stitch in the ditch quilting. Wasn’t that an awesome experiment yesterday? I had so much fun playing with the various settings for the length and width of the satin and zigzag stitches. 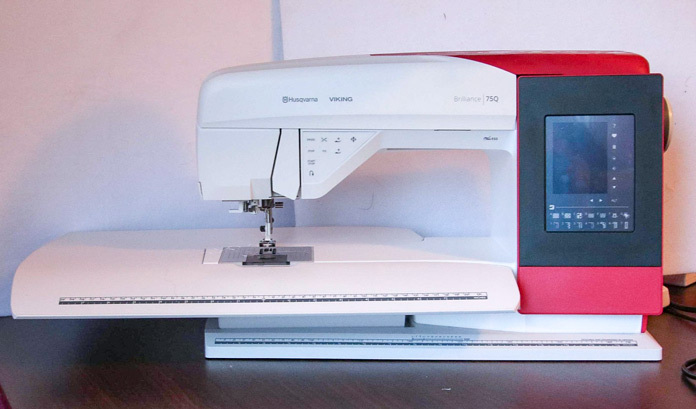 Experimenting with the sewing machine is a great way to learn and when the sewing machine you’re using is the Husqvarna Viking Brilliance 75Q, well, you know you’ll be satisfied every time with whatever stitch you choose. Now that you’ve seen some satin stitching and decorative stitching in action, I’m taking a moment to look at the difference between a satin stitch and a zigzag stitch. After years of using both of these stitches, I recently came to understand the real difference between them. All I knew was that I appreciated the look of the BUILT-IN satin stitch on the Husqvarna Viking Brilliance 75Q. I was getting a beautiful finish to my applique, but I didn’t know why! Now I know and I’m excited to share it with you. Hi! I’m so excited to introduce next week’s posts on QUILTsocial! Are you ready for an exciting week of quilting fun? Award-winning quilter, Claire Haillot of Quilting with Claire, is walking us through her free quilt pattern called, Deep Waters. A quilt that looks complex to make, but she assures me it’s really easy to make. Claire makes it easy using her awesome tips she calls ‘best-kept secrets’. I hope you liked the lesson from yesterday’s post about perfecting the satin stitch. It’s time to think about applique outside the box. One feature on sewing machines is the number of decorative stitches that the machine is capable of stitching. However, I’ve heard many quilters say, “oh – I only use a zigzag and a straight stitch.” Perhaps, it’s time to break out of that rut and try some of those decorative stitches on your sewing machine? https://youtu.be/4YEgjVJOovAHello everyone! It’s great to be back and I’ve got a new sewing machine to share with you. This is the Husqvarna Viking Brilliance 75Q. This sewing machine is made for quilters! You’ve got all the basic stitches you need for your quilting tasks, and there are lots of decorative stitches which I’ll review tomorrow. Ever wonder how to spruce up your machine applique methods? In this week’s posts, written by the awesome Elaine Theriault of Crazy Quilter on a Bike, this topic is explored extensively with the help of the Husqvarna Viking Brilliance 75Q, newly released in October 2018.